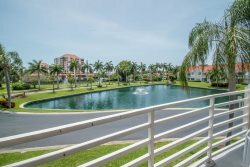 Vista Verde East #265 | Spacious updated condo with a waterview! Just a few lines to say thank you for a wonderful experience staying in your efficiency at Island Inn. The rooms were very clean and well decorated and the walk in shower was a delight. Very well equipped with every utensil needed for a 2 week vacation. Close to every kind of restaurant we needed, and many attractions in the immediate area. Unbelievable sunsets when sitting on the balcony with the beach and sea beneath your feet. The Inn has an outside pool equipped with a great Tikki bar. Ample car parking and the staff are all a delight. Just back and have already booked for next year. The Realty company is also helpful and at hand should anything go wrong. This place was perfect for total relaxation. We saw dolphins and manatees in the water from our balcony The accommodations were comfortable and clean I will definitely be back! We enjoyed the nice, clean and cosy condo (newly furnished) a lot for 6 weeks. Private dock infront of the door (with view from the living room) fishing and else. Walking distance to the beach (5 minutes, no car needed). We successfully booked this great condo for next year 2 months. We had a great stay! Despite the rain we brought with us, we still managed to have a great time. The condo was the perfect size for the 6 of us. The pool was refreshing when the heat come back and even swimming in the rain was fun! Great place for the price. Large master bedroom with windows overlooking the inlet. We had planned to have our son in a pack and play with his grandmother in the second bedroom but the closet was so big in the master that we just put him in there and left the door open. Lots of beach supplies and the kitchen was stocked well. We would love to give a recommendation for the staff at Next Home Beach Time Realty, We have been renting in St. Pete Beach, Florida for over ten years and stopped in to meet a rental agent, Danyelle Landreth. She was able to show us that we could purchase for about the same price we were renting a condo. The staff at Next Home Beach Time Realty were great all helping us thru the process and they are now renting the condo we purchased. The company is amazing and would highly recommend them to family and friends. For the money, this spot is excellent. You are steps from the beach. Pass a grille is a quite area perfect for families. The cottage is comfortable and perfect for a max of 4 people. Could use a dishwasher, but has every other creature comfort. The Lands End grounds and the apartment are beautiful. The photos are 100% accurate. We had all the comforts of home, plus the advantages of water views, pool and gorgeous beachfront. The property is serene, within minutes of restaurants and food shopping, easy travel into St. Pete's and Tampa if you wish. We had painless check ins and outs. We will be back soon. We recently stayed at Waves during a quick getaway to celebrate my partner's birthday. Many of the units in the building are vacation rentals and all the guests we spoke with were very friendly. We had no issues at with using any of the common amenities, pool, etc. The location is perfect as it is about a block away from the beach. We found the unit to be very clean with newer furnishings. I was happy to see there was a TV in the living room and both bedrooms. The unit is about one block from the beach and is a short walk to shops and restaurants and bars nearby. The reservation, check-in and check-out process was very straightforward and easy. Overall fantastic experience and would highly recommend. Loved the updates since last visited, the other tenants were friendly and really fun. Saw some of the same faces I had seen at my last visit. I think that says a lot about how comfortable and homey it feels. Beautiful grounds, very convenient to many amenities . We recently stayed at the condo and it was beyond our expectations! Beautifully decorated, well kept and fully equipped. We loved the location, it was within walking distance of everything we needed. Great restaurants within walking distance. the beach was less than a five minute walk. The people staying here were great! The pool was fantastic and the fact that you could always find a shaded area was a bonus for my husband. Cannot rave enough about this place. Had a great vacation and would highly recommend this to anyone looking for a vacation rental in the St. Pete Breach area. The condo had everything we could possibly need to make our visit complete. From the appliances to the beach toys, we could not have asked for a better equipped accommodation. We will definitely be using this condo again. Lots of space. Right next to pool. And walking distance to so much. What more could you want? Great location - we had a conference at the tradewinds and it was about a two minute walk away. The rental had lots of space. We stayed with our 3-year old and she loved the pool (and the beach toys that were on our balcony). Great beachfront property with perfect location. A quick walk through the grass and you are on the beach. Within walking distance of beach bars, restaurants, and Don Cesar's. Second story deck allows for unobstructed views of the gulf. Perfect for watching dolphins while enjoying morning coffee or enjoying a drink during the sunset. Our party of 6 never felt cramped - the house feels bigger than it actually is. Ample bathrooms, large bedrooms, etc. Whatever we needed during the stay seemed to be within reach (bottle openers, plates, etc.). Was nice to have laundry and dishwasher on site. Felt like we were right at home. Would stay there again. Annie and her teaml offer first class service and are very professional and friendly. I was impressed with the products that are available to the property owners and that they have the top of technology to offer. I interviewed several property management companies before finding Next Home Beach Time Realty and I knew immediately they were the ones for me. I am so happy I found them. We have been working with Danyell for several years and couldn't be happier with her professionalism, follow-up and attention to detail. We know when we reach out to her with a question, a problem or even just looking for information that we will have a response back to us very quickly. She is a delight to work with. We've had a great experience working with Next Home Beach Time the past 2 years. They're very responsive to our needs, and we've had more rentals than we'd ever imagined. I have been using this company for almost 4 years and I'm very happy with their level of professionalism and their performance. I have deal with other companies before, I was never as satisfied as now. Danyell is one of the best property managers I have ever had. After 35 years of owning rental properties it has been my experience that there are not many in this field who live up to my standards! Danyell is one of those few who handle my properties the way I would myself. She is a real go-getter and deals with any problems that come up with speed and competency. She has very good decision making skills and also has great social skills in dealing with all of our clients. I'm looking forward to working with her long term. We stayed at one of the properties during our friend's wedding and had the most wonderful experience ever. The property itself was gorgeous, not to mention the absolutely stunning views of the beach. Beach Time was extremely friendly and accommodating and made sure we had everything we needed. We had such a fantastic time staying there and I would recommend any of Beach Time's properties to anyone looking to stay on St. Pete Beach.